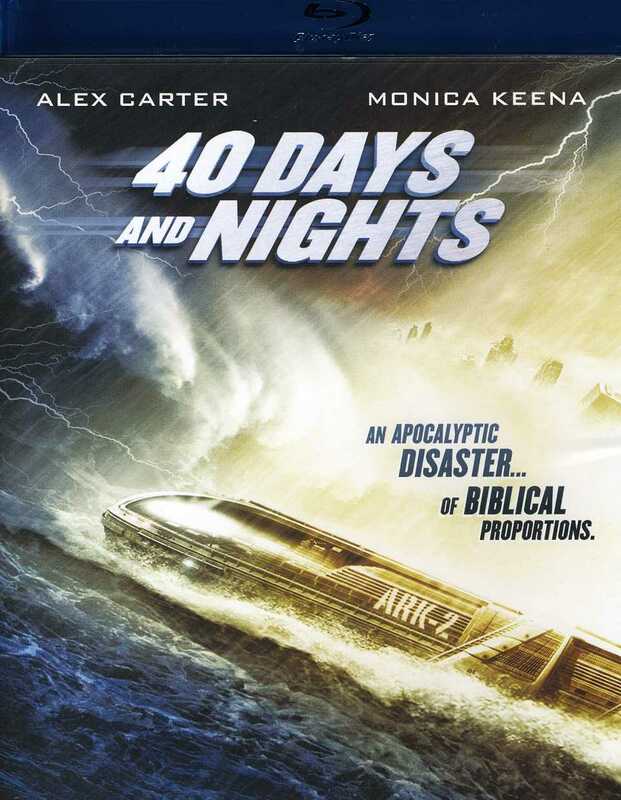 DVD Archive Review: When time runs out for mankind to prepare for a repeat flood of the globe, scientists get to work on finishing the “Ark’s”; vessels that will brave the rising tides, destructive seas and lashing rain which will last for 40 Days and Nights – A Biblical occurrence which is estimated to be upon the human race within the next 50 years. For the finished construction of “The Ark’”, our last best hope lays in the hands of these people who will, after the threats have subsided create a brand new world for man to continue…and live. Asylum Studios, “Who are they?”, “What are they?” and “Where are they from?”…As well as “Why do they make films?” Okay, let’s investigate a little into the background of this high rising Film Company before we reveal our “Review” on this movie. Alright, moving on…40 Days and Nights had become a more ‘shoved’ film to us than those which have been given for an honest and impartial review, like “Meloncholia” and “Drive”, which were good films, just misunderstood by the media hype that somehow made them out to be the best thing since sliced bread. It was throughout viewing “40 Days and Nights” that I, myself wanted to reach for the remote control, though there were moments [and I do mean moments] where the film scenes were okay. Don’t get me wrong, because as I have already mentioned so many times over the last 20+ years “The world needs B-Movie’s”. It really does, and as such, you will find that “40 Days and Nights” fits that bill immediately into the 24th minute of viewing. The cast is unknown, unless you have seen the same Actor’s in yet another Asylum Film or a B-Movie in the America’s. Though to be completely fair, some were actually dedicated and passionate about their parts, which drove the momentary scenes I mentioned into possible salvageable parts for the “Real Movie”; it could be remade into some of a greater picture, and in saying this, the storyline could be tweaked enough to bring to the Cinema World a near as adequate “Day After Tomorrow” Apocalyptic, Action, Adventure film – The 3 A’s. Posted in BluRay, BluRay Reviews, Film Reviews, Trailers and tagged 40 Days, 40 Nights, Adam Burch, Alex Arleo, Alex Ball, Alex Carter, Apocalyptic Disaster, Christianna Carmine, David Bittick, Hector Luis Bustamante, hollywood, Monica Keena, Robin MacPherson, Ty Barnett, Victoria Barabas. Bookmark the permalink.